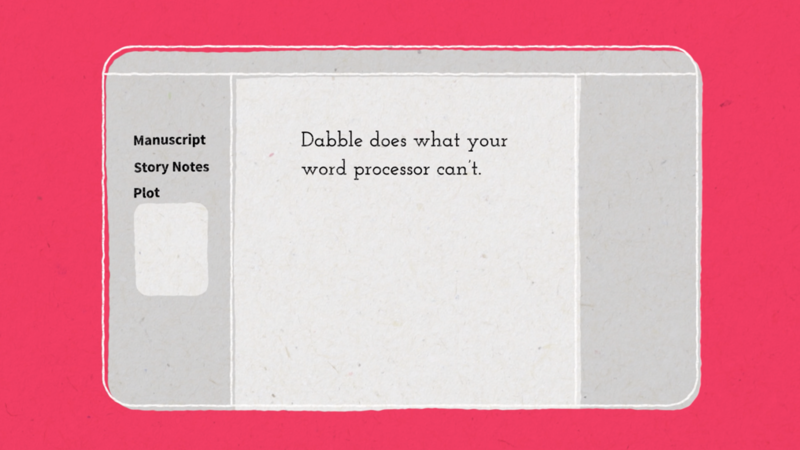 Dabble does what your word processor can't! Dabble organizes your manuscript, story notes, and plot. Dabble simplifies story, leaving more room in your brain to create, which is what being a writer is really about. Divide your manuscript into parts, chapters, and scenes, navigate your novel with a click, and reorder your scenes with drag and drop. Stay focused as you write. Auto-scrolling scrolls the page as you type so your hands never have to leave the keyboard. Auto-focus-mode fades out everything but the page and text as you type to help you stay in the zone. Auto-formatting allows you to focus on writing words instead of formatting chapter titles. Set up the events in each subplot to happen at the right time in your story. Keep plotting, writing, and editing wherever you are. Write in the desktop app on your Mac or Windows computer at home. Write in the browser during your lunch break at work. Write offline at the cabin over the weekend. Automatically sync to the cloud. Sync your novel up to the cloud and between computers. Dabble keeps a full copy on each computer and one in the cloud. These copies sync with each other when they are online. Use Dabble’s web app at app.dabblewriter.com or download the desktop app on our downloads page. Dabble helps you set and keep goals. Dabble will auto-calculate your daily word count goal, based on how many writing days are left before your goal deadline. You may not be able (or want to) write every single day. Dabble allows you to mark the days you are taking off so it can accurately track your daily word goal. Set a goal that is right for you, and set a starting count to only track new words. Set your goal to 20,000 words on top of the 80,000 you already have.